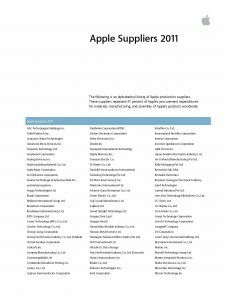 Last week, Apple Inc. took the first step in addressing the serious worker health and safety issues with its suppliers, by publicly disclosing a list of 97% of its supply chain and by announcing it had joined the Fair Labor Association (FLA), a multi-stakeholder group that monitors workplace conditions. But is this a significant step in improving the working conditions for the people that make Apple’s products? First, it’s important to understand the context for this announcement. Apple’s actions were long overdue, as the company had barely responded following a series of suicides in the last two years, committed by workers at Foxconn Technology Group in China, one of Apple’s primary contract manufacturers, and the largest contract manufacturer in the world. (It’s largest factory in China has over 500,000 workers.) Labor rights groups say that the suicides at Foxconn resulted from powerless employees, driven to despair over harsh working conditions, including standing 10 hours per day, enduring military-style management, low pay, and extensive (mandatory) overtime, far exceeding what’s allowed under the law. Workers are routinely shortchanged on their wages, due to “miscalculations,” and they must fight just to receive what they are owed. Eighteen workers attempted suicide in 2010 (with 15 deaths), mostly by jumping from upper floors to their deaths. The suicides came at a time when Apple was demanding that Foxconn meet aggressive production schedules to keep up with demand for iPhones and iPads. Foxconn responded to the suicides by installing anti-suicide nets around the buildings. They also made employees sign pledges not to commit suicide! They also hired counselors and raised wages for workers at the Shenzen facility, although the new wage is only slightly above the new minimum wage required by the Shenzen government, according to a report called “Foxconn and Apple Fail to Fulfill Promises: Predicaments of workers After the Suicides,” by Students & Scholars Against Corporate (SACOM). Plus, says SACOM, they made the wages seem larger than they really are by reclassifying money previously paid as housing and food allowance into salary payments. The net income is almost the same as before. Apple applauded these actions by Foxconn at the time. Foxconn is reducing the size of the workforce at Shenzen,(in Guangdong Province, where wage rates have seen the highest rise in China) sending many of them plus new hires to their other factories in the interior of China, like the Chengdu facility, where wages are lower. What’s amazing is that after all the pain and suffering endured by these Foxconn workers in making Apple products, their work accounts for a only small portion of the total value of the product. A July 2010 report by market research firm iSupply, breaking down the actual costs of the iPhone 4, found that assembly costs accounted for only about one percent of the total $600 cost, or $6.54 (Profit was $360.) This suggests that a simple decrease in profits or a simple increase in price on each iPhone could make a world of difference to the people that make them. According to Want China Times, Terry Gou, the head of Hon Hai (Foxconn), the largest contract manufacturer in the world, had this to say at a recent meeting with his senior managers: “Hon Hai has a workforce of over one million worldwide and as human beings are also animals, to manage one million animals gives me a headache,” said Hon Hai chairman Terry Gou at a recent year-end party, adding that he wants to learn from Chin Shih-chien, director of Taipei Zoo, regarding how animals should be managed. Foxconn’s Chengdu plant, which makes iPads for Apple, had an explosion last May, killing three people and injuring 18 more, caused by combustible aluminum dust. In December 2011, a similar explosion at a Shanghai plant run by a different supplier (Pegatron) injured 61 people. In 2010 Apple had problems with another manufacturer called Wintek , where 137 workers at their Suzhou plant were sent to the hospital after being exposed to the highly toxic chemical n-hexane on the assembly line making Apple touch screens. N-Hexane has long been known as a serious occupational health hazard and many companies no longer use it as a solvent. Workers say that Wintek pressured some of the injured workers into resigning and taking cash settlements, even though exposure to the chemical can cause long-term health problems including nerve damage. Some are still unable to return to work. Foxconn makes many Apple products, including iPhones, iPads, and MacBook Pros. They also make products, parts, or subassemblies for many other electronics companies, including HP, Dell, Microsoft, Sony, Nintendo, Amazon (Kindles), Microsoft (Xbox), Panasonic, Samsung, Lenovo, and Nokia. While many of its plants are in China, it’s controlled by Hon Hai Precision Industry of Taiwan. Other brand name companies also have problems resulting from Foxconn conditions. As recently as January 2 of this year, 150 workers at a Foxconn plant in Wuhan, China climbed up to the roof of their building and some threatened to jump to their deaths in protest over management imposed changes and wage issues. These workers were reported to be from the Microsoft Xbox assembly line. (They eventually settled with the company). All factories had people working overtime hours from 36 – 160 per month. (Legal limit is 36 hours). In nine of the ten factories, the minimum monthly wage ($138 in one factory) didn’t meet the living costs of many workers, which leaves them no other option but to take many hours of overtime work just to survive. High pressure production line conditions, often standing for 8 to 10 hours a day or more. Breaks are often not allowed. Discrimination. All ten factories were found to discriminate in hiring. Many prefer young (often below 18 years), female workers who are seen as easier to control. China Labor Watch concluded that these are systemic problems in the electronics industry, which require new strategies to change. So what kinds of strategies are needed, and did Apple take the right first step? Transparency is always a good first step. The labor conditions of electronics workers have been pretty well hidden (at least from the U.S. audience) by the electronics industry for a long time, so any real solution must start by shining a bright light on all aspects of this problem. More disclosure about who the suppliers are is certainly a good first step, and Apple has now done that. While many in the media are calling Apple’s disclosure an unprecedented step, Apple is not actually the first to do this. In response to demands from activists around the world, HP published its supply chain list back in 2008. Dell maintains a similar list on its website, following HP’s lead. But it was a particularly significant change for Apple, which has had an historic obsession with secrecy, and we hope that this signals a new era of transparency for Apple under new CEO Tim Cook. But like HP and Dell, Apple’s disclosure is just an alphabetical list of suppliers, without addresses, or even countries, and without any other details, like who makes what and classic discount pack where. Or which companies are their top 10 or 20 suppliers by volume, or by income. So this disclosure doesn’t provide much help to anyone who wants to research and track down working conditions and environmental pollution at any of Apple’s suppliers. What is needed is much more detailed disclosures about the locations, and operations by these contract companies side effects 6 months and full disclosure of working conditions as well as the occupational and environmental health track record. Consumers should be able to know where their products were made and by whom. This is particularly important for the high-tech brands, since most consumer electronics are not manufactured by the company whose name goes on it. Consumers need to be able to figure out who actually did make their products , and how those companies are performing on standards for labor rights, health and safety, and the environment. Only then can consumers exercise their purchasing power by rewarding those that have the best track record on issues of concern. Companies should also be transparent about the chemicals and materials used to make their products, including what the workers are exposed to as well as what ends up in the product. Workers often have very limited information about the chemicals they are handling, which limits their ability to understand what kind of precautions should be used. The second part of Apple’s announcement last week was that it had joined the Fair Labor Association (FLA), as the first electronics manufacturer. (FLA was formed to address issues in the garment industry.) Because FLA is a multi-stakeholder group, this will hopefully mean that Apple is now willing to dialogue with international groups, including labor rights groups, and labor unions. That could be a positive step, but it remains to be seen whether Apple will open the lines of communication. We hope so. In joining the FLA, Apple must now follow the FLA’s workplace Code of Conduct, and make sure the code of conduct is implemented throughout its supply chain. International labor rights groups, including Good Electronics Network and MakeITfair are somewhat skeptical that this approach will yield real results, in part because they believe solving the problem requires the brand companies like Apple to pay a fair price to suppliers, who must agree to reasonable delivery times (without forced overtime) and who pay a decent wage to their employees. They believe that the FLA does not adequately address that problem with its Code of Conduct approach. They also point out that FLA only audits 5% of the supplier base, not the whole supply chain, and they had trouble meeting even that goal. Once upon a time, you could buy products that were made in the U.S. (or other developed countries like Japan) by people who were employees of the brand name companies. But companies have shifted to using overseas contractors, who work with subcontractors who have even more subcontractors. These supply chains are complex and it’s very difficult for one manufacturer to effect change. Current strategies – like the FLA or the EICC (Electronics Industry Citizenship Coalition) who have both established voluntary codes of conduct – may sound good, but they are enforced only by audits, are too easily gamed by a supply chain in countries where cheating your audits (which are announced well in advance) is a well-honed skill. So we hope that these moves by Apple are not the only ones they will make, but are the first of MANY steps to help fix this broken and deplorable situation and that all the other brand name electronics companies invest some of their billions of dollars in profits into assuring that their suppliers are paying their workers a living wage, providing a healthy and safe workplace, and ensuring that their handling of toxic chemicals used in production do not damage their workers or the environment. What would real leadership in sustainability look like? The Daily Show, Comedy Central Jon Stewart’s brilliant and hilarious take on conditions for iPhone workers in “FearFactory.” January 16, 2012. Mr.Daisey and the Apple Factory This American Life, Public Radio International. Jan 6, 2012 “Mike Daisey was a self-described “worshipper in the cult of Mac.” Then he saw some photos from a new iPhone, taken by workers at the factory where it was made. Mike wondered: Who makes all my crap? He traveled to China to find out. Tragedies of Globalization: The Truth Behind Electronics Sweatshops China Labor Watch, July 12, 2011. Link to report. Foxconn and Apple Fail to Fulfill Promises: Predicaments of Workers after the Suicides. Students & Scholars Against Corporate Misbehaviour (SACOM), Hong Kong, May 6, 2011. Link to report. Apple Joins Fair Labor Association: Will other IT companies follow suit? by the Institute for Occupational Health and Safety Development, January 18, 2012 Link to article.